I had to stay on the roads. The forest is still not runnable. Ice and snow and icy snow. And mud. It was a nice run. Originally planned to go out for just 8km, but I always prefer running a loop over running the same way back, so in the end it was almost 13km. I just threw my running into fifth gear and enjoyed my stream of thought. Rewinding yesterday’s races and some stuff related to the rowsandall.com site. What a relief. I prolonged my membership of the sub-7 minutes group yesterday, at the “ErgoShow”. 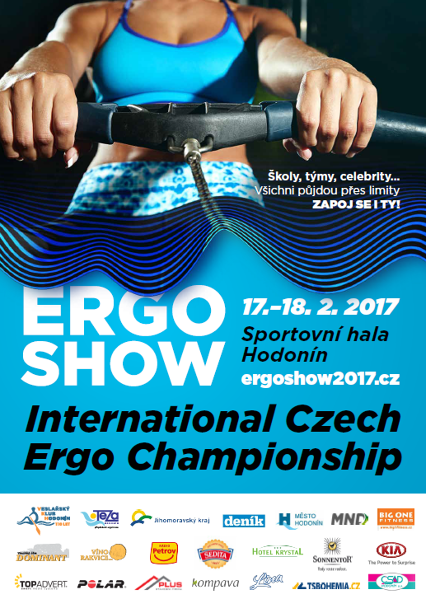 The ErgoShow was an indoor rowing event. The main part of the event was the Czech Indoor Rowing Championships, but they had fun events around it. For Masters, there was a 1k race in the morning (to which I didn’t participate) and they had University Fours. Four ergs slides connected together, racing over 4 minutes. The sum of the four distance scores is the score of the four. Teams of different universities rowed against each other in this format. They also had live broadcasting over YouTube and a very good commenter. In the morning, I followed the races from my living room. I ended up cheering to the computer monitor when my daughter Lenka rowed her race. Just after lunch, one of the other Masters at our club, picked me up in his minivan. A quick round through Brno to pick up the others and we were on our way to Hodonin, a 1 hour drive south of Brno. The venue was really nice. There was a warming up room with lots of ergs, a separate cooling down room with lots of ergs and bikes, and the main hall with two stages full of ergs. Another nice detail was lots of places where you could refill your water bottle with a sports drink for free. 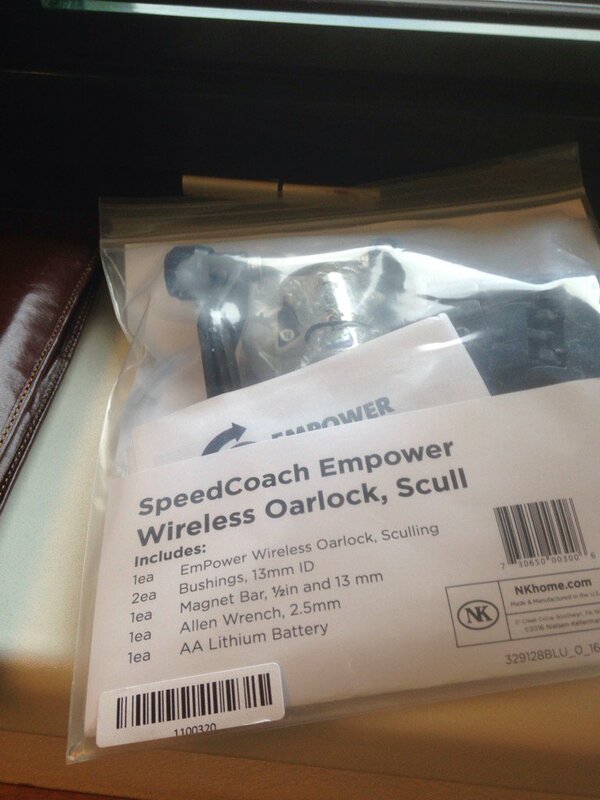 Yes – my own Empower Oarlock. Too bad there is still 40cm of ice on our lake. I also got an iphone connection kit. Unfortunately, I was already too focused on my race, and didn’t check it. At home, I found out that they had given me a connection kit for the iphone 4, which has a different connector than my iphone 5. Well, trainings at the club will remain unconnected for a while. Concept2 did ask me if I could come around for a chat after the races. Now it was less than an hour to my scheduled racing time. Time to change clothes and hop on one of the warming up ergs, a model D with a PM3. After about 6km of Fletcher-like warming up (I can never remember the exact durations and paces, but I think I get it sort of right) it was time to visit the bathroom and some other confused running around. By the time I was done with that, it was 10 minutes to the scheduled time for my race. On the monitor next to the erg I could see that my little boat was in the back of the pack. I knew this was going to happen and I actually rowed my own race. After the first few starting strokes I found myself at 1:39, with an average of 1:46. I continued conservatively, pulling 1:45/1:46 1:46 with the occasional 1:44 in the first 800m (I was mentally doing 1:46, but there were enough strokes at 1:45). At 1200m to go I switched to “1:45” (i.e. I banned 1:46 strokes). Rowed down to 900 to go, then to 600 to go, at which point I started pulling 1:44. With 300m to go I went all out. There was a guy who was 8m ahead of me. I nearly got him, but in the end he finished 2 seconds earlier. No drama, really. Even though I wondered whether there was more in the tank, I was glad I paced conservatively. After my 7:09 debacle I wasn’t sure if I was in sub-7 shape. Actually when my competitors asked what I was aiming for, I jokingly answered that I would go for 6 minutes and 60 seconds. The “quick chat” at the Concept2 booth started with “Why haven’t you told us about your project?” and it turned into a slightly longer, friendly chat. At one point my team mates threatened to leave without me, so I had to stop chatting and jump in the car back to Brno. 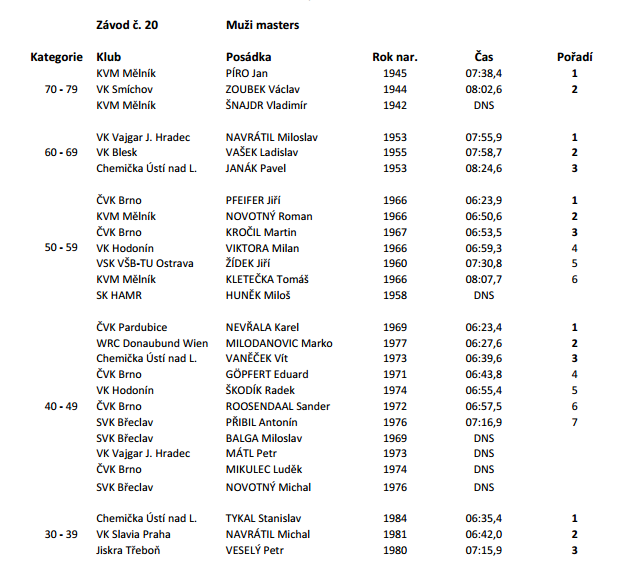 Here are the full results in the Masters category. Our Jiri Pfeifer rowed a nice row for a 51 year old (6:23.9). My race was won by Karel Nevrala. He moved to live with his Mix 2x partner, who now also is his girlfriend, and both of them have taken to train very hard. Romana and I beat them in the Mix 2x a couple of time, but she rowed a 6:57.6 yesterday, so she nearly chicked me. Unfortunately, I cannot look at my race on YouTube any more because the Warner Music Group has blocked it for copyright reasons. Yes, there was background music played at the venue!